Once upon a time building a green home meant building an unusual structure that didn't blend with other more traditional architectural styles. Now, with The House Designers, you can find a wide variety of green, energy efficient home plans in every style from ranch to craftsman to contemporary and traditional in every size imaginable. The House Designers has made it easy to build your dream green home reducing the use of fossil fuels and lowering your energy costs by 20-30 percent by offering a wide array of house plans and floor plans that are ENERGY STAR® approved. 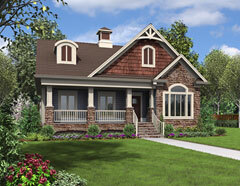 The Award-winning Evergreen Cottage House Plan from The House Designers exclusive ENERGY STAR® house plan collection offers tremendous flexibility in its design, while offering the latest in green technology and innovation. 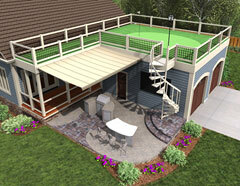 Both active and passive energy saving technologies have been considered, with such features as 6-inch SIP exterior walls, a 20-square-foot grass roof tile system, a Gale Vertical Axis Winder Generator or a Wind-Finder hidden in the traditionally detailed cupola, a rainwater capture and storage system, along with photovoltaic and water heating panels. By using toxin-free building materials you'll combat indoor air pollution, which can be much worse than outdoor pollution. When building your new home consider using products like wheat-derived strawboard, natural linoleum made from jute and linseed oil, paints with little or no volatile organic compounds and toxin-free insulation made from soybeans. Keep your family-breathing better by installing natural ventilation with the use of mechanical ventilation systems to filter and bring fresh air inside and vent stale air outside. Reduce your energy costs by 20-30 percent and reduce your water usage by 40-50% by using WaterSensible faucets and plumbing fixtures. This can add up to major savings. Build a more durable than most standard homes because of high-quality building materials and better construction methods. The resell value of a green home is higher than that of a standard home, and the market demand for green homes continues to rise as consumers worry about rising energy costs. Local, state and federal governments offer tax breaks and other incentives for building LEED and ENERGY STAR® approved homes. This Award-winning green house plan was designed with south facing windows and correctly apportioned overhangs to maximize solar heat gain in the cold winter months, while providing shelter from the intense heat in the summer. In the winter months, the slab on grade will radiate heat well after the sun has set. Residential cooling and heating alone make up more than 20% of the United States' yearly energy use. Consider household lighting, appliances and other electronic equipment, and homes are clearly a major source of energy consumption. Green homes use 20-30% less energy than comparable standard homes. Consider alternative energy sources that are powered by the sun, water and wind like solar panels and wind turbines. Efficient plumbing and bathing fixtures, drought-tolerant landscaping and water-conserving irrigation systems can help green homes use on average 50% less water than standard homes. 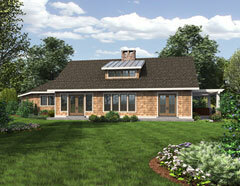 Sustainable building means using fewer natural resources in the construction of a green home. Many green building materials are made of a significant amount of recycled content. Some companies, for example, now make carpets and floor tiles from recycled tires and bottles. Green homes can also be constructed with salvaged materials from demolished buildings. Green homes use materials made from rapidly renewable materials, like bamboo, hemp, agrifibers and soybean-based products. And the use of wood that is certified by the Forest Stewardship Council helps promote socially and environmentally beneficial forestry practices. Consider that a standard 2,500-square-foot home creates approximately two tons of construction waste that ends up in our landfills. By starting with green, ENERGY STAR® house plans and building a sustainable home, 50% to 90% less waste will end up in our landfills. If you're building a green home, the first thing you should consider is purchasing a house plan that is ENERGY STAR® approved to assure your home will be built utilizing the latest in green building techniques and energy efficient products. 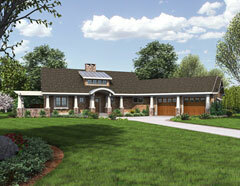 All of the house plans on thehousedesigners.com are available with an optional ENERGY STAR® plan package.